which version of cqrlog you use? To me s58t shows Slovenia. I have noticed that sometime the country is correct after logging, but changes after a "refresh data". This problems affects DXCC statistics....worked countries are not considered in the final score. I stated wrongly, hamqth has nothing to do with your problem. from utils "Repair database" ? Somehow CTY.dat is corrupted ? but CQRLog did not ask to reload cty.dat or others files. See in attached pic other wrong country XQ3SK was Slovenia and then changed to Japan by itself. Close and start CQRLOG again and confirm auto upgrade when it asks it at start. Can't duplicate this problem. It does not seem to be related to country files. Export your whole log to ADIF without any country ID, create a new fresh log and import. From NewQSO/File/Preferences/Program there is "Offsets". As you can read from there you can adjust grayline there. From my last screenshot you also see checkboxes that are needed for automatic dxcc update. After restartin Japan qso changet to to Chile ...see the pic. Does not answer. That is why it did not ask about update at start. I pushed latest cty from my ~/.config/cqrlog/ctyfiles to my google drive. You can dowload it from there, place to your ~/.config/cqrlog/ctyfiles and untar it to same folder. After that NewQSO/Window/QSO list/File/Import/DXCC data and navigate to ~/.config/cqrlog/ctyfiles folder. Ambiquous.tbl is the first file that is already selected. Press "Open". Then go back to NewQSO and check how it works then. because some time the country is correct, than a refresh makes it wrong. ok2cqr website is working again, so I removed tgz from my google drive. You should have had a prompt for new tables now when starting cqrlog. I assume you have latest cqrlog (?). Version 2.30(001) or 2.3.0(002) or my test binary 2.3.0.(20x). If you have older version we can stop this bug seeking right away. Make a new empty log at NewQSO/"Open or create new log". Play with that fresh log and see if countries show up ok. If they do so with new log return your daily log. Make full ADIF export of your log. Import ADIF to new, working, log. You could transfer preferences also from old log, but maybe it is best that you go through all tabs in preferences and manually set proper values. Delete old daily log (after you have checked that all data was transformed). I think this is the simplest way. Other option is to start playing with sql console to repair things. I made all this ...on the new log the countries seems correct....I am using the version 2.3.0(002) ....and the 001 before. Let's see if in the use of next days the wrong country happens again. Doing so I have lost the configurations....I have reloaded from LoTW all the confirmed countries but, connected to wsjt-x it does not seems to recognize confirmed countries. So there was some kid of error in old log's database. I think the new one wil work ok for now on. First check your old log(gets blue color), then press utils/configuration/export and save configration to somewhere. Uncheck "Open recent log after program start". Press utils/configuration/import and select the file you just saved. (leave export selection DXCC unchecked, check all others). I have tried to import the configuration file....the small window says: file imported.... but actually nothing has been imported. First do export settings from old log to fille. (as you already included your last message). 1) set cqrlog so that it does not open recent log at statup, close cqrlog. 6) open new log and all settings are there, just tested. Any other way seems to give wrong result. If you did not scramble passwords from your cqrlog-conf.txt you added to massage I recommend you to change them now. They are in plain text format in configuration export file. This is not told anywhere (I must fix this). it can be done only into an empty database. 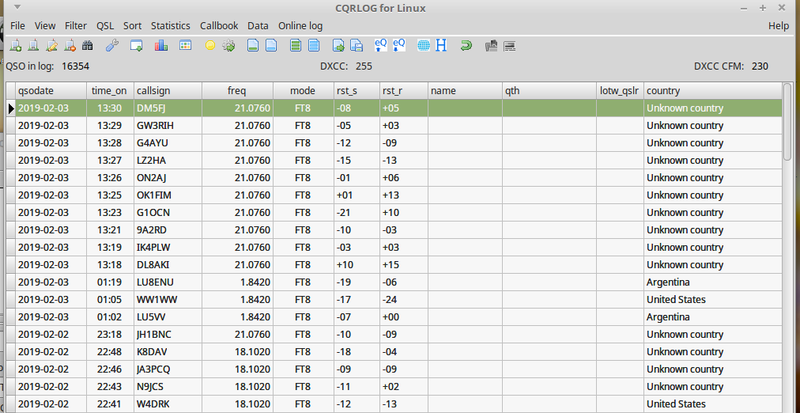 Please, how can I make cqrlog to show the MODE column into the New QSO window ? 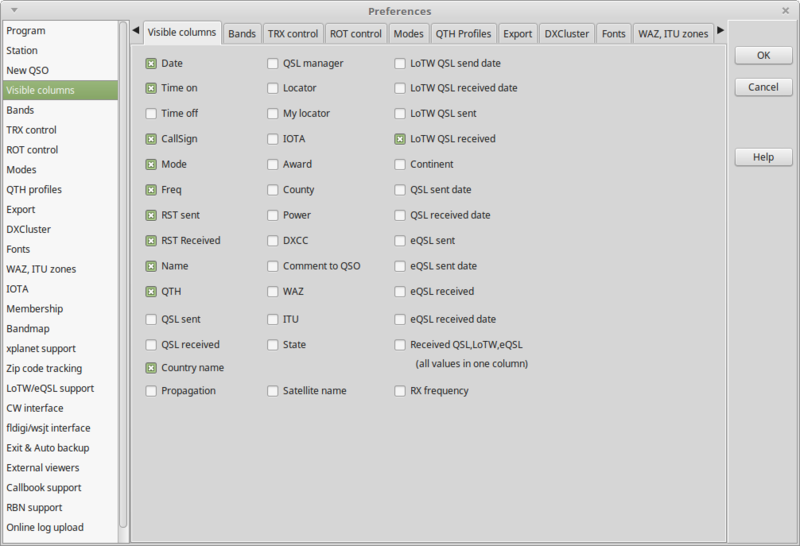 It looks like the configuration of columns only works with the QSO List window ....see the attached pics. For some unknown reason I have found out that cloning log settings work only if they are done just that way I have listed. There is a bug somewhere, but using that order makes a workaround. 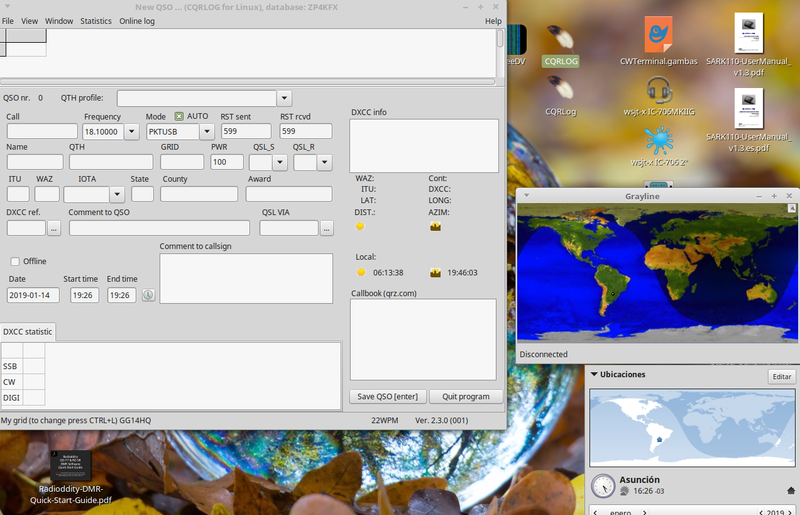 I just tired to add a new one to my NewQSO view and it works. Note that it will be visible after next update of log view. Not immediately when you press OK at preferences. Sometimes columns can be hidden by other too wide columns. Then click, and keep down, left mouse button when cursor is over title row's column. You will get double headed arrow cursor and drag the width. That way you can make column wider or narrower and get them all fit to widow width. I have MODE marked since I did start using cqrlog but the MODE column appears only in the QSO List...not in the New QSO ...see picture. You will see there is no line "mode=70". Add this line like I have done here. Create a new log and import this cqrlog-config.ini using steps I wrote few messages earlier. Open this new log and try to enter new qso. Do you see mode column now ? Or you have something weird in your setup. But what? If this would be a common bug there would be lot more reports of this. Sounds weird if you can get it working by setting up a fresh log and after a while it is not working any more. Have you tried Database connection window/utils/repair database ? And if you get it working how long it works? Until shutdown, or longer period? 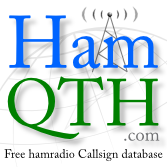 Or does DXCC/QSLmanager update get it wrong?